DeadPix is an application that can help you fix pixels that are stuck on your screen. DeadPix helps in resolving stuck pixels on your screen. It works, simply by rapidly cycling the color value of the stuck pixel. The author recommends leaving it on for at least 10 minutes for best results. Please note that this tool does not provide a 100% success rate. If you don’t know if you have any stuck pixels or if for some reason you can’t see your stuck pixels, you could try using the stuck pixel locator that is included in DeadPix. The stuck pixel locator will change the color of your entire monitor to a random or custom color so that the stuck pixels are more noticeable. DeadPix Portable is a lightweight application designed to identify and quickly fix dead pixels on your screen by switching through multiple colors. It has some easy-to-use options. Although it's wrapped in a portable package, the tool has software dependencies. To be more specific, it cannot run unless you have .NET Framework installed. The utility is packed in a clean and intuitive interface made from one window that shows all options put at your disposal. 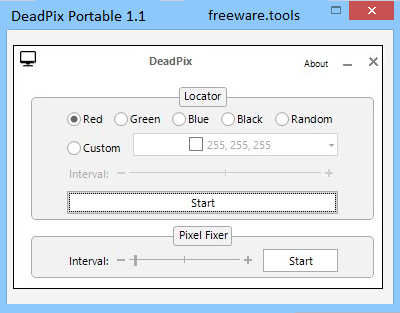 There are two main components that make up DeadPix Portable: the pixel locator and the fixer. When it comes to the pixel identification feature, you can choose the color that will cover the entire screen in order to spot the stuck pixels in contrast. The typical options include red, green, blue and black, but you can look for a custom color in the color spectrum provided by the app as well as opt for random mode to toggle multiple colors. In random mode, you can also control the time interval between color switches. Once this step is complete, simply click "Start" to fill the entire screen with the selected color. After spotting the dead pixels, you can return to the main window to adjust the duration of the pixel fixer, draw the region containing the stuck pixels, and put it in action. It should rapidly change colors until the issue is fixed. The developer recommends running this app for at least 10 minutes and cannot guarantee its efficiency. All aspects considered, DeadPix Portable can be used by those interested in first resorting to software solutions in the attempt to fix dead pixels before considering changing their monitors due to this type of problem.